Jason Dunstall is a true great of both the Hawthorn Football Club and the Australian Football League. He is one of the greatest full forwards the game has ever witnessed and universally regarded as the sport’s best Queensland-born talent. Dunstall played in the 1986, 1988, 1989 and 1991 premierships as well as five pre-season premierships. 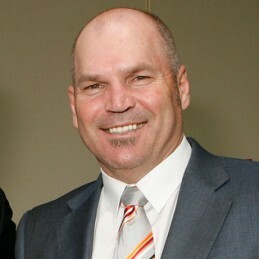 He was Hawthorn’s captain from 1995 to 1998, All-Australian four times and a member of the Hawthorn team of the century. Following 269 games he retired in 1998 with 1254 goals, the game’s third highest goal kicker of all time, behind Tony Lockett and Gordon Coventry. Following his highly successful playing career and his work as a regular panelist during the early years of Channel Nine’s The Footy Show, Dunstall transitioned into the media, guest commentating on Channel Seven and Radio 3AW. In 2002 Dunstall was inducted into the AFL Hall of Fame. He has held the position of interim CEO and served on the board of directors of the Hawthorn Football Club. Dunstall has hosted Triple M radio’s The Gospel, Channel Seven’s Live and Kicking and various programs on Foxtel’s Fox Footy including Saturday Central with Wayne Carey, On the Couch and League Teams. He is currently the co-host of The Dead Set Legends with Andrew Gaze on Saturday mornings on Triple M Melbourne and the host of After the Bounce on Fox Footy.